A study shows that men improve their golf game, a 31.5% drop on their handicap, when their sleep apnea is treated with continuous positive airway pressure (CPAP) therapy. The game improvement is attributed to better concentration, endurance and decision making resulting from the treatment. Sleep Apnea is a disorder where a person has shallow, obstructed, or paused breathing while asleep. Each pause in breathing is called an apnea. The apnea can vary from a few seconds to a few minutes. A loud snort or choking sound happens when normal breathing resumes. A person moves out of the deep sleep state into light sleep when breathing is hindered because of sleep apnea. This results in poor sleep quality, fatigue and excessive daytime sleepiness. Sleep apnea treatments involve keeping the air passage open, allowing the patient to breath easily. CPAP therapy uses a device that assists in breathing while the person is sleeping. It is a tight fitting face mask that is attached to a machine to regulate breathing. In the study, after a six month CPAP therapy improves daytime sleepiness, sleep-related quality of life, and an 11 percent drop in their average golf handicap index. A new study suggests that treating obstructive sleep apnea (OSA) with continuous positive airway pressure (CPAP) therapy improves golf performance in middle-aged men. Results show that up to six months of treatment with CPAP therapy was associated with significant improvements in self-reported excessive daytime sleepiness and sleep-related quality of life. Participants treated with CPAP therapy also experienced a significant drop of 11 percent in their average handicap index, a standardized formula that estimates a golfer's skill level. Among the more skilled golfers who had a baseline handicap index of 12 or less, the average handicap index dropped by 31.5 percent. Participants attributed their enhanced performance to factors such as improved concentration, endurance and decision making. 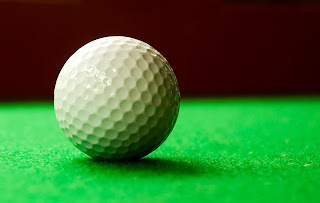 "The degree of improvement was most substantial in the better golfers who have done a superior job of managing the technical and mechanical aspects of golf," said principal investigator and lead author Dr. Marc Benton, senior partner at Atlantic Sleep & Pulmonary Associates and medical director of SleepWell Centers of NJ in Madison, N.J. "With the cognitive enhancement afforded by successful treatment of their sleep apnea, they saw measurable improvement early and more significantly than those who were less skilled." The study results appear in the Dec. 15 issue of the Journal of Clinical Sleep Medicine, which is published by the American Academy of Sleep Medicine. Objective data reporting shows that average utilization of CPAP therapy by participants in the treatment group was 6.3 hours per night for 91.4 percent of the nights, which is a much higher compliance rate than is typically reported. The results suggest that the potential for improved golf performance may have played a motivational role in increasing treatment compliance. "An important aspect of providing high quality, patient-centered care is to identify the unique factors that motivate individual patients to comply with treatment," said American Academy of Sleep Medicine President Dr. M. Safwan Badr. "Effectively treating sleep apnea with CPAP therapy can yield numerous physical, cognitive and emotional benefits, all of which can be great motivators for patients when they begin treatment." Benton and colleague Neil Friedman studied 12 men with moderate to severe obstructive sleep apnea who had a mean age of 55 years. A control group comprised 12 men without sleep apnea who were matched for age and handicap index. Participants had to maintain a handicap with the Golf Handicap and Information Network (GHIN), which is a service of the Unites States Golf Association (USGA). Their handicap index was recalculated after completion of 20 rounds of golf during the study period. According to the authors, most avid golfers in the U.S. are adult males between 40 and 70 years of age, which is a demographic that has a high prevalence of obstructive sleep apnea. The AASM reports that OSA is a common sleep illness affecting up to seven percent of men and five percent of women. It involves repetitive episodes of complete or partial upper airway obstruction occurring during sleep despite an ongoing effort to breathe. The most effective treatment option for OSA is CPAP therapy, which helps keep the airway open by providing a stream of air through a mask that is worn during sleep.